This is one of my favorite desserts: it is light, creamy, fresh, and not as overly sweet as many dessert you can buy here in the US. I also love its presentation: a contrast between fresh orange slices and a simple solid cream. In the past, I just waited for someone to prepare and serve it along, and then I would have my taste buds jump up and down with joy. But now I decided it is time to learn how to prepare this dessert myself. Here is the recipe, if you want to give it a try. - To start, place a deep (preferably metal) bowl in the freezer: we need it cold to prepare the whipping cream. - If you're starting with whole eggs, then separate the yellows from the whites. We won't be using the whites for this recipe - feel free to use them to prepare a healthy omelette or another dessert (how about a Raspberry Foam?). - Whisk the yellows with the sugar, then mix with the milk and juices from a lemon and an orange until uniform. Place in a pot on medium heat, and bring to a boil while stirring frequently. The milk loves to bubble up and make a mess on the oven, so keep an eye on it. - Meanwhile, mix the gelatin in three tablespoons of water, and let stand for two or three minutes. Add a quarter of a cup of hot water, and mix thoroughly until all the gelatin has dissolved. Pour over the hot milk in the pot, and stir until uniform. Remove from heat, and let cool until it thickens. I usually place the pot in an ice water bath until it reaches room temperature, then transfer the pot to the fridge. We're looking for pudding-like consistency. - While the hot mixture is cooling off, you have time to whip the heavy cream. Remove the previously chilled bowl from the freezer. I use a mixer on high speed, and it takes less than 5 minutes to start seeing peaks forming. Add the vanilla essence, and mix until you can easily remove the whisk out of the cream and there is no dripping. Place the whipped cream in the fridge until it is needed. As a note, proper whipped cream could have also used three or four tablespoons of powdered sugar (added in at the same time as the vanilla). But we will combine the whipped cream with the milk mixture, which already has plenty of sugar, so we can skip on adding extra sugar to the whipped cream. - Once the milk mixture has reached a pudding-like consistency and the whipped cream is ready, we can go to the final steps of the preparation. We will use a large pot, and we will flip the cake upside down when firm; so whatever goes to the bottom of the pot will become to top of the cake. Coat the pot with a bit of oil, then stretch a layer of plastic foil all around: this will help us flip over the cake without any pieces sticking to the pot. Also, make sure the plastic foil extends past the top of the pot - this will help remove it once we flip the cake over. - Extract the juice from one orange and set separately. Feel free to add a splash or rum or amaretto to the orange juice, if you feel adventurous. - Peel and slice the remaining oranges, then place them on the bottom and along the side of the pot. This will bring beautiful fresh orange accents to the presentation (see photo above). - Once the previous step is ready, quickly combine the chilled milk mixture with the whipped cream. Place about half of it over the orange slices. Dip half of the lady fingers in orange juice, the place the over the cream close to one another. Gently press them in. Continue with another layer of cream, and one more of lady fingers (also dipped in orange juice). Make sure this final layer is pressed into the cream such that it is as flat as possible: remember that we will flip the cake over, and the cake might break if its bottom has ridges. - Cover the cake pot with a layer of plastic foil, and refrigerate overnight. - For presentation, we will first flip the cake over. Start by removing the top layer of plastic foil. Pick a nice flat plate, place it centered and faced down over the cake pot, then quickly flip the pot over. The final step is to carefully remove the remaining plastic foil. 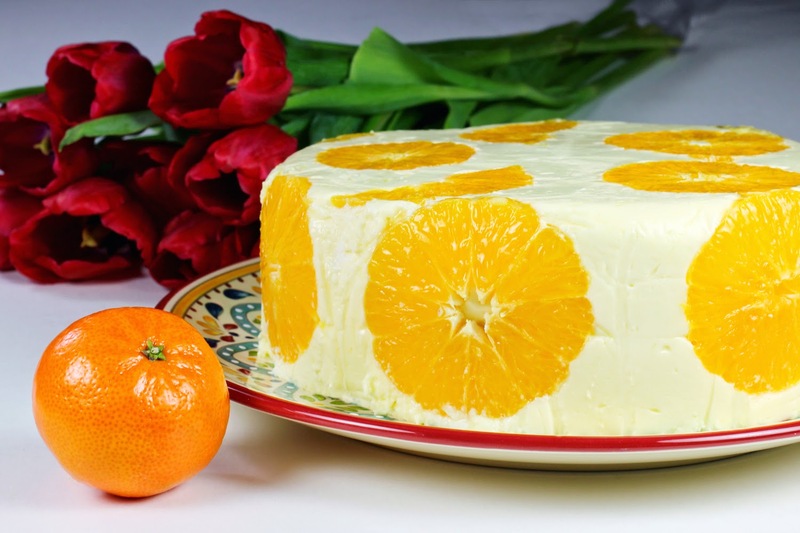 - I love the presentation in and of itself: a clean white cake with beautiful orange accents. - A few flowers can further add a nice touch of color to the presentation.